Just a right-click of your mouse in a folder and the file is created.. and a lot more! 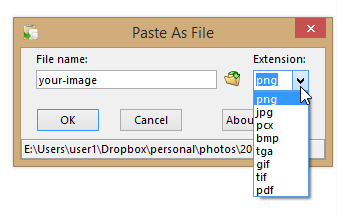 The filetype can be: txt, pdf, html, rtf (formatted), jpg, pcx, png, bmp, tga, gif, tif, php plus many more. 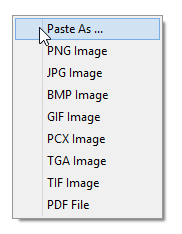 This is the official site for Paste As File. There are many other sites with hacked versions of this useful utility, but do not use those sites as they are not supported. Description: Paste As File is an app to paste the contents of the clipboard to a new file in the current folder via the context menu windows explorer background. 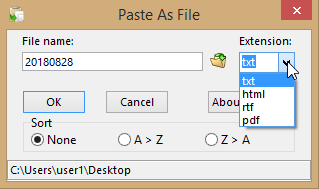 It can paste as a text file, RTF file, PDF file, or image file based on the contents of the clipboard. Supported image formats are jpg, pcx, png, bmp, tga, gif, tif and PDF.